Good morning everyone! It's time for another fun Thursday challenge from the Create with Connie and Mary team! This week we have a fabulous color challenge! Check out these great colors!! 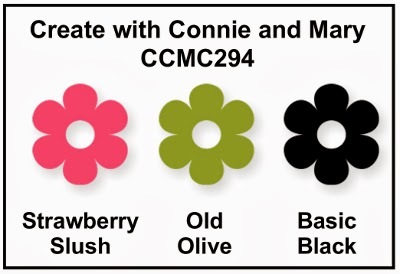 Strawberry Slush, Old Olive and Basic Black are the bold bright colors for this week! I love them!! And I don't use Strawberry Slush nearly enough so I was so glad it was part of this challenge! Check out my card! Find more inspiration from the other fabulous designers at Create with Connie and Mary. I hope you all will play along with us this week! Thanks for stopping by and have a super day!! Debbie...this is beautiful! I love this! Fantastic layout...love the way the oval framelit sets the focal point for this card...love the paper piercing! Into my faves! In fact, I may have to lift this to use for my Easter cards this year! So pretty! This is so gorgeous! Love the piercing around the oval and white on white! Great job with the color challenge this week! This card is so gorgeous! Your coloring is beautiful and the piercing is a great way to frame the oval. Plus, I love how you used Naturals White card stock for your card. I think the little flecks in it really go well with a botanical type card. I have always loved the Naturals card stock but forget to use them. Your card is totally awesome with the paper piercing and one single banner, adorable! Oh I love your tulip card! It is very elegant and has so many wonderful details! Simply Beautiful! WOW! This is simply beautiful! Love the touch of paper piercing and the subtleness of the blended colors! 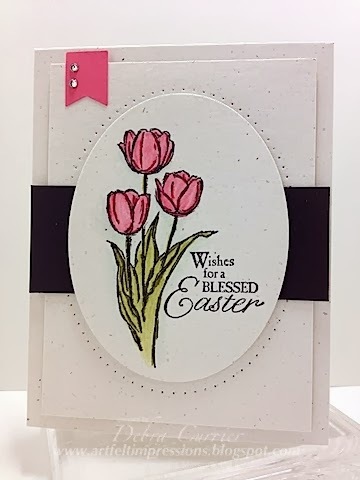 What a beautiful Spring card! I love the extra little details of the banner and paper piercing, they really make the card amazing.